Gearboxes, Speed Reducers and Drives - Nordex , Inc. Mechanical drives take supplied torque and may increase or reduce that torque based on application. Also speed is increased or decreased in proportion to the speed reduction ratio. Nordex has a full line of gearboxes and speed reducers, and the components needed to build them, in a wide range of standard ratios and shaft options as well as custom designs. Helical, bevel, and miter gear boxes offer the options of speed reducers or speed increasers, and may be driven in either direction. All Nordex worm gear speed reducers and right angle drives are manufactured for high performance in a large spectrum of applications. 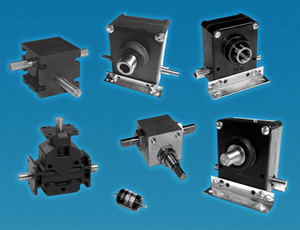 Typically worm gear boxes are not used as speed increasers. The cases are molded glass-filled material making them extremely rugged and resistant to corrosive environments. They are offered in a wide range of ratios and are equipped with right hand or left hand worm gears. The output shafts may be solid or hollow, and load capacity is unaffected by direction and rotation. Worm gear speed reducers are comprised of a screw (the worm) that drives a wheel (helical gear) or single enveloping wheel and are used in mechanical applications ranging from conveyors to exercise devices to robots. Geneva mechanisms and assemblies are typically used to transform continuous rotary motion into intermittent rotary motion. The rotating drive wheel has a pin that reaches into a slot of the driven wheel advancing it by one step and a blocking disc that locks the driven wheel in position between steps.